News - Page 50 of 50 - Mulzer Crushed Stone, Inc. News - Page 50 of 50 - Mulzer Crushed Stone, Inc.
WFIE Channel 14 reported on a major project for Mulzer Crushed Stone. American Municipal Power is building a $416 million dollar Hydroelectric plant along side the Cannelton Locks and dam. Over the next 12 months Mulzer will supply 160 barges of quarry rock and 275 barges of sand (estimated). Visit http://www.14wfie.com/Global/story.asp?S=10855348 to read the article and watch the video. The Video has a shot of a Mulzer barge being unloaded. 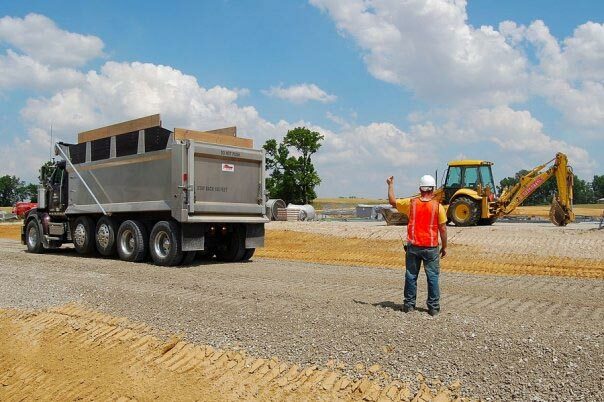 Indiana Mineral Aggregates Association honored Mulzer Crushed Stone, Inc.’s Temple Quarry, located in English, IN, with the Association’s first “Community Connection” Award at a special Awards Luncheon held in February. This award is given to the plant that most clearly demonstrates efforts above and beyond the regular requirements of the Excellence in Mining Awards. The “Community Connection” Award honors community involvement that demonstrates the contributions of many employees in donating their time and serving their community. Tim Mulzer and Troy McCorkle, Temple Quarry Superintendent, received the prestigious award on behalf of the company, recognizing over 200 hours of documented community service by Temple Quarry employees. Indiana Mining Aggregates Association is a trade association representing crushed stone, sand and gravel, and slag companies throughout Indiana. This organization’s current membership consists of 43 producer companies which comprise 156 plants and quarries that produce 92% of the aggregate mined in Indiana. Indiana ranks 11th nationally in the production of crushed stone, 15th nationally in the production of sand and gravel, and first in the production of slag. 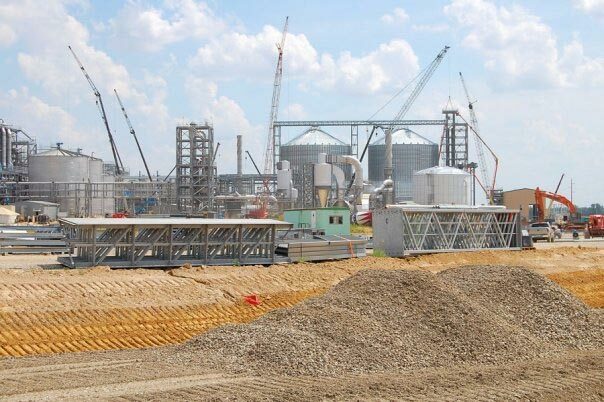 PROJECT SPOTLIGHT: Abengoa Biofuels, located near AB Brown Plant in Posey Co. This new age Biofuel plant will produce E85 Ethanol out of agriculature products, namely corn. Contractors ICI, Summit Contracting, Deig Bros., Railworks, Mulzer and Agrisystems are working together to build this modern biofuel plant. Mulzer will supply almost 150k ton of aggregates to this project. 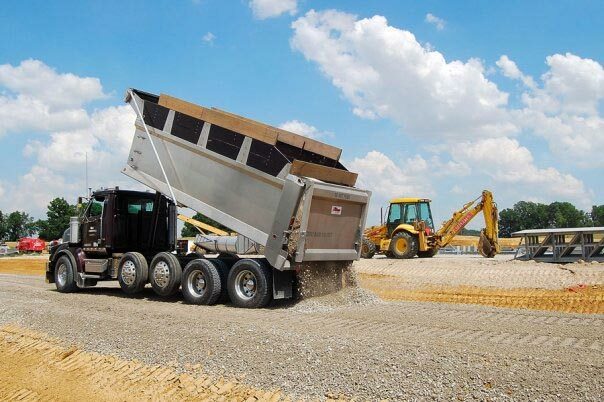 Mulzer Crushed Stone, Inc. has it's own fleet of tri-axle trucks, Materials Transport, as well as a network of lease trucks used in the delivery of our aggregate products. Trucking companies are one of most important partners! New Abengoa Biofuel plant will produce E85 Ethanol using agricultural products, specifically corn. Almost 150,000 ton of aggregate will be used in the creation of the Abengoa Biofuel Plant. Thirteen Mulzer locations were honored with “Excellence in Mining” Gold awards by the Indiana Mineral Aggregates Association on January 31. The “Excellence in Mining” are presented annually to companies who excel in the following categories: Environmental Programs, Safety Activities, Employee Relations, and Community Relations. These awards promote pride in the programs at the locations. Gold, silver or bronze certificates are awarded to those locations that have successfully met the specified requirements to receive recognitions at one of the three award levels. Congratulations to the following Mulzer locations that received Gold Awards. PROJECT SPOTLIGHT: Enlow Field – Bosse High School, Evansville, Ind. 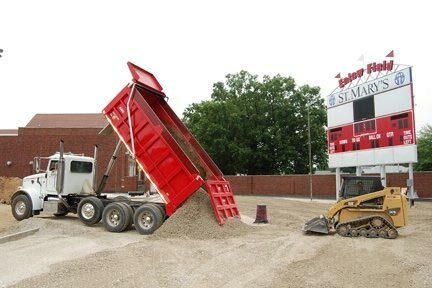 Enlow Field is getting a makeover – Aggregate Style! Mulzer Crushed Stone, Inc. is supplying 53’s to the rebuilding project at Enlow Field, the first in a series of three projects for EVSC. 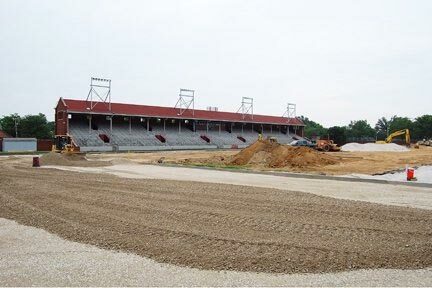 Bosse, Reitz and Central High Schools will all receive athletic field re-builds this summer, led by contractor, Koberstein Contracting using 53’s from Mulzer.